Use these meringue ghosts individually to decorate the tops of cupcakes or make slightly smaller versions to cover the top of a Halloween-themed cake. Preheat the oven to 110°C/gas mark ¼. Line a large baking sheet with nonstick baking paper. Fit a 1.5cm nozzle into a piping bag. Add the egg whites and maple syrup to a bowl set over a pan of simmering water. Using an electric hand-held beater, whisk the mixture for 4 to 5 minutes, until white, glossy and thick enough to form a stiff peak. Remove from the heat and spoon the meringue mixture into the piping bag. Pipe 10 peaked domes onto the lined tray, spaced well apart. Each one should be about 4cm in diameter on the bottom and 4cm high and they should resemble ghost shapes. Cut the raisins in half and arrange two pieces near the top of each one as eyes. Bake in the oven for 1½ hours, until crisp on the bottom but still slightly soft to the touch in the centre. Turn the oven off and leave the meringues inside with the door ajar until they are completely cool. Meanwhile, to make the dip, put the blackberries and cinnamon in a small pan and crush with a fork to release the berries’ juices. Heat gently for 5 minutes, until thickened slightly. Blitz in a mini blender until as smooth as possible. Pour into a serving dish and leave to cool. Place the dip in the centre of a serving plate. 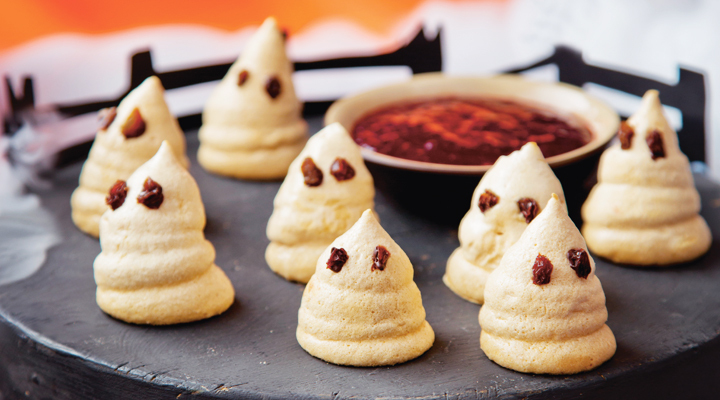 Arrange the cooled meringue ghosts all around and serve.